St. John’s sounding board is one of the last original architectural features in the church, dating to 1741 when St. John’s was built. It hangs above the elevated pulpit and was in place when Patrick Henry delivered his “Liberty or Death” speech inside the church in 1775. With the help of generous donors and conservator Carey Howlett, the sounding board has been restored to its original appearance. The analysis took months and the findings are as amazing as the beautifully restored piece itself. Reinstalled above the pulpit on Good Friday (2017), the sounding board is back in all its glory. The sounding board not only reflects the Rector’s voice down to the parishioners seated below, its newly gilded surface also beautifully reflects the light in the church. Gold on the tulip poplar, darker wood is walnut. Conservator Carey Howlett restored the sounding board to its original appearance which he discovered after nearly three years of exhaustive investigation. During the research process, Howlett found minute bits of gold material trapped in the pores of the tulip poplar sections of the sounding board. He also detected bits of light-colored paint residue on the yellow pine that is the background of the sunburst image. Howlett ultimately determined that the original background was off-white and that the sun’s rays were gilded tulip poplar alongside clear-finished walnut. The inlaid poplar face was also gilded, darker walnut making detail lines of the eyes and eyebrows, defining the shadows on the face. For more on this project, please see the summary below, with text from the Study and Analysis Report by F. Carey Howlett. The sounding board which dates to 1741 is located above the pulpit inside St. John’s. The Study and Analysis Report was commissioned by the Foundation as part of the recently completed Legacy of Liberty Preservation Project: Phase 2, with a grant from the Cynthia Woods Mitchell Fund for Historic Interiors of the National Trust for Historic Preservation and support from the Garland & Agnes Taylor Gray Foundation. St. John’s sounding board hangs above the elevated pulpit and serves as a means to direct the rector’s voice to the parishioners below. It is one of the last remaining original architectural features in the church and dates to 1741 when St. John’s was built. It was in place when Patrick Henry delivered his “Liberty or Death” speech inside the church. Darkened with age and previous restoration attempts, St. John’s sounding board is in need of conservation. The Foundation hired conservator Carey Howlett to determine the best course of action for its conservation and care. The result is a report that details and documents historic changes to the sounding board and possible evidence of its original appearance. Howlett’s study also makes connections to other colonial pieces that may have been made by the same hands, moving us a few steps closer to uncovering the artist. Lastly, the study includes discoveries regarding the symbolism behind the human face found on the sounding board. St. John’s sounding board is an extremely rare example of Virginia-made intarsia of the first half of the eighteenth century. While intarsia and marquetry were relatively common in Europe in the 17th and 18th centuries, the techniques were less commonly used in Great Britain and nearly absent from the American colonies. Indeed, inlaid ornament was uncommon in American architecture and furniture until the latter half of the 18th century when inlaid surfaces in the neoclassical taste became the fashion. The Christ Church sounding board in Lancaster County, Virginia dates to c. 1735. Note that there is no face in the center of the starburst. Given its rarity then, it’s exciting that Howlett uncovered three examples of intarsia dating to the period when St. John’s Church was built in 1741. All appear to relate in form and execution to the St. John’s sounding board and thus it is conceivable that they came from the same hand. Intarsia is a form of wood inlaying similar to marquetry. The practice dates before the seventh century. Intarsia consists of a design assembled from contrasting segments of wood that is inlaid into a solid substrate. Intarsia is different from marquetry, which consists of veneers assembled into an ornamental design which is then glued onto a flat surface. 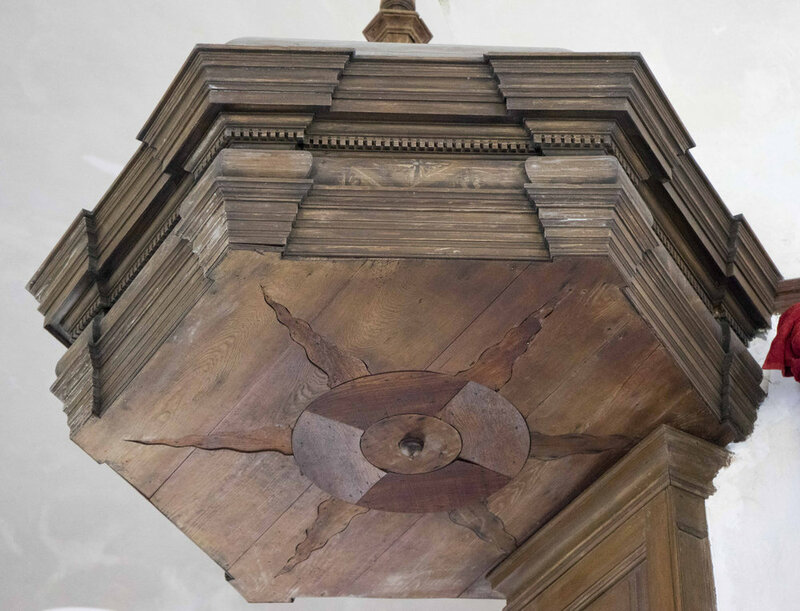 The earliest example of Virginia intarsia is an object very closely related to the St. John’s sounding board: a simpler but similarly executed sunburst found on the sounding board at Christ Church in Lancaster County VA. The sounding board at Christ Church displays similarities to St. John’s which are unlikely to be coincidental. Though constructed differently, yellow pine provides a nearly identical background for the inlaid intarsia design. 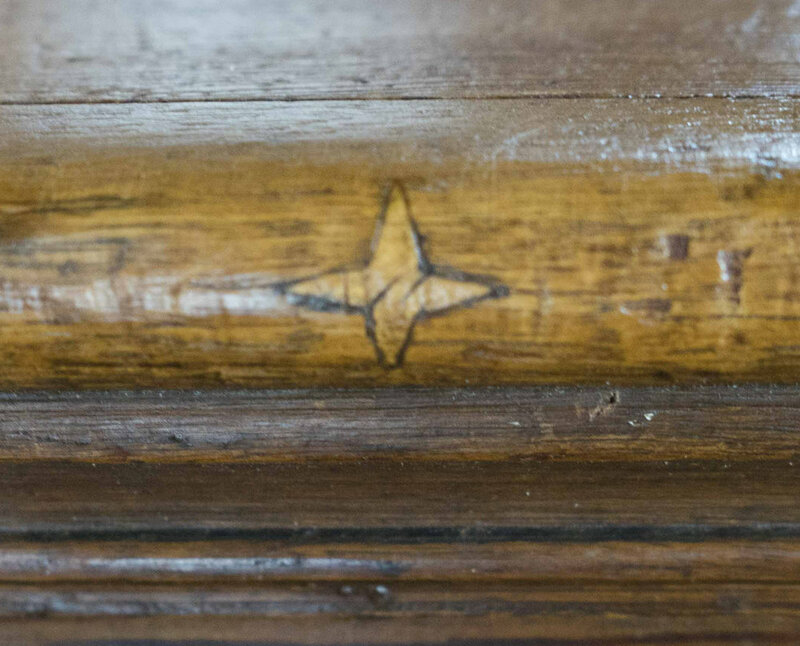 There is also some evidence of white or off-white paint in the separations between the pine boards, suggesting that, like St. John’s, the yellow pine on Christ Church sounding board may have been painted a very light color to contrast with the sunburst. The design of the wavy rays, created in walnut laid into a yellow pine back ground, represent a striking similarity to the work at St. John’s. While there is no conclusive proof that the same hand executed both sun designs, the similarities reveal an undeniable connection. Spice chest descended in the family of Richard Randolph, Eastern Virginia, 1735-1750. Privately owned. Photo courtesy of Christopher Swan, Colonial Williamsburg Foundation. Another example of Virginia-made intarsia bears a strong relationship to the St. John’s sounding board and may be the most intriguing discovery to date. According to family tradition, a small spice chest on a stand descended from Richard Randolph to his grandson John Randolph of Roanoke. Richard Randolph was a member of the St. John’s Church vestry who served as undertaker for the building of the church in the years 1739-1741. The chest appears to date from 1735 to 1750 (the stand seems to be of somewhat later construction, perhaps 1770-1780) and has elements directly associating it with furniture made in eastern Virginia. 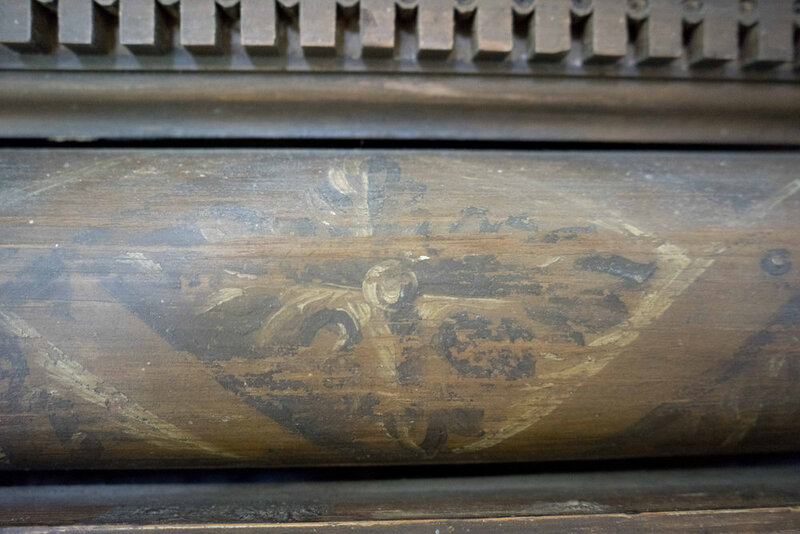 A fleur-de-lis, a rare detail for a pre-1750 Virginia piece, raises speculation about the origins of the chest designer. And yet the alternating dark, wavy rays and light-colored straight rays of the chest’s inlay clearly indicate a connection to the St. John’s sounding board. The execution of the chest’s intarsia does appear coarser than that of St. John’s -- gaps between elements are larger, the wavy rays are somewhat awkwardly attenuated, and the shaping of the various elements appears less precise -- suggesting that the chest may be the work of second artisan familiar with the church’s sounding board. Further research into the Christ Church sunburst, the Randolph spice chest intarsia, and the St. John’s Church sounding board may result in the discovery of a long-forgotten artisan or artisans, possibly of European origin, who contributed to all of these projects. Plate CXIV from Batty Langley’s The City and Country Buiilder’s and Workman’s Treasury of Designs, first published in 1740. St. John’s sounding board is the sole colonial Virginia example bearing an inlaid sunburst surrounding a human face. The singularity and the unusual nature of the sunburst emanating from a face on the St. John’s Church sounding board is worthy of exploration. Scholars of Virginia architecture and decorative arts understandably look to British sources for influences on formal designs dating from the colonial era. Design books by authors such as James Gibbs, Palladio (British editions), Batty Langley and others were imported into the libraries of the Virginia gentry and served as source books for builders and cabinetmakers. Batty Langley’s pragmatic and detailed drawings were particularly useful for workmen in the Colonial era. The pulpit and sounding board at St. John’s Church, while not taken directly from Langley’s book, nonetheless display the conventional hexagonal form drawn by Langley as well as his convention of a striking sunburst. How did the face of the sun come to be on St. John’s sounding board? Perhaps the answer lies in the adaptation by colonial Virginians of the ideas and values of the Enlightenment, the eighteenth-century philosophical and scientific movement promoting ideals of reason, tolerance, liberty, and moral and scientific progress. The Enlightenment drew upon ancient classical philosophy as well as the scientific revolution, and the British manifestation of this Age of Reason remained in concert with Christian Protestant notions of individual will and moral progress. While the philosophy of the Enlightenment is best found in the writings of such luminaries as John Locke, David Hume, and Voltaire, the ideas of the movement were promulgated to a much greater degree in Britain and the American colonies by the fraternal organization of Freemasonry, which was just coming into prominence in Virginia in the second quarter of the eighteenth century. Peyton Randolph, President of the Second VA Convention. Detail of back of the Benjamin Bucktrout Masonic Master’s Chair, c. 1769. The Colonial Williamsburg Foundation. Photo by Hans Lorenz. Freemasonry drew its symbology from numerous sources -- from pagan religion to classical antiquity to 16th century alchemy to deistic Christianity -- as the organization saw itself as a source of universal truth. Most British and American freemasons in the 18th century saw no conflict between their Masonic membership and their Christian faith, as both were a means for moral edification. Probably nowhere did colonial Virginians encounter the symbol of the sun with a human face more than in the imagery associated with the Masonic lodge, where the Sun, the Moon and the Worshipful Master served as the Three Great Lights of the fraternal organization. An excellent example of this symbolism is found on the masonic master’s chair by Williamsburg cabinetmaker Benjamin Bucktrout, a chair probably made in the late 1760s to serve as the ceremonial chair for Peyton Randolph, then the Provincial Grand Master of Virginia Freemasonry and later the first president of the Continental Congress. Peyton Randolph was also President of the Second Virginia Convention of March 1775 when Patrick Henry delivered his “Liberty or Death” speech. The Foundation is excited by this tangible connection to Peyton Randolph who was an influential leader during the early years of the Revolution and spent much time at St. John’s during the convention. The sunburst on the master’s chair, although carved and gilt, bears a striking resemblance to the inlay on the St. John’s sounding board, both showing alternately wavy and straight rays as well as stylized, almost cartoonlike facial features. 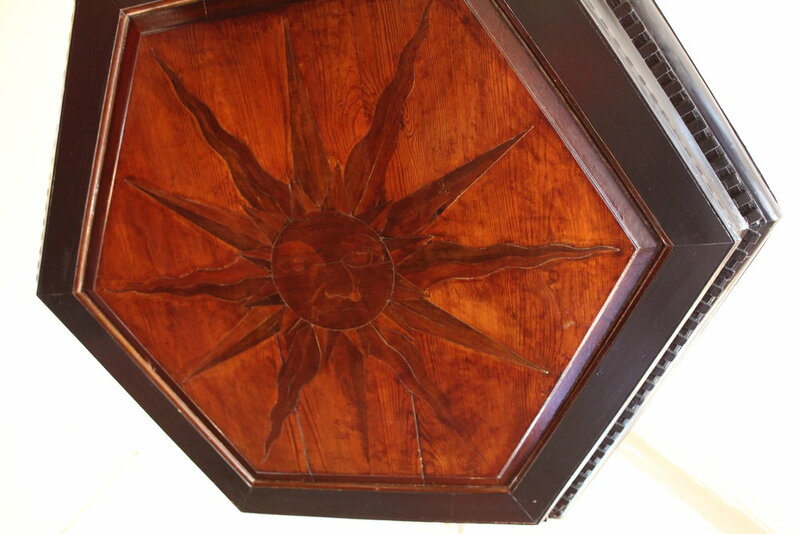 Whether the maker of the sunburst at St. John’s Church consciously selected the classical symbol of Apollo, borrowed symbology from Freemasonry, or simply chose the design as a somewhat more elaborate example of a conventional sounding board sunburst is unimportant. The true power of a symbol is its ability to evoke multiple layers of meaning. Detail of pen and ink drawing by Albrecht Durer, 1500- 1502, showing Apollo holding an anthropomorphic sun. During his “Liberty or Death” speech delivered inside St. John’s on March 23, 1775, Mr. Henry said, “I have but one lamp by which my feet are guided and that is the lamp of experience.” It is anyone’s guess if the sounding board was a source of inspiration for Mr. Henry. Howlett takes samples of the board’s surface. Carey Howlett’s Study and Analysis Report included an in-depth examination of the physical condition of the sounding board. In 2015 the sounding board was temporarily removed to allow Howlett to clean it and take 10 small samples for microscopic analysis. 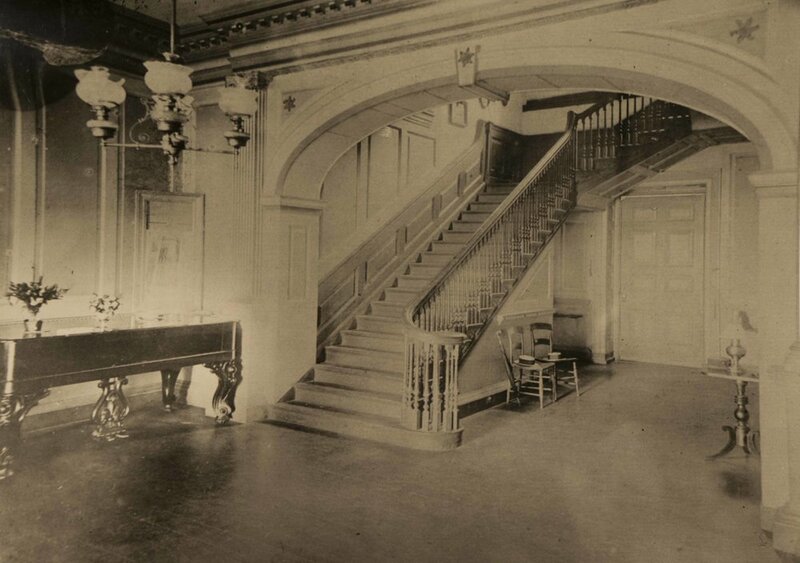 His visual inspection revealed evidence of previous cleanings, sanding and scraping of the wood and in some areas a buildup of stain and multiple layers of clear coatings like shellac. Previous cleaning efforts seriously compromised the original appearance of the sunburst making it very dark and hard to see. Howlett holds a sample collected from the sounding board. Howlett used a small scapel to take 10 samples of coatings and wood from areas believed to be part of the original construction. Samples taken were judicious, unobtrusive, and carried out with as little intrusion into the historic surface as possible. 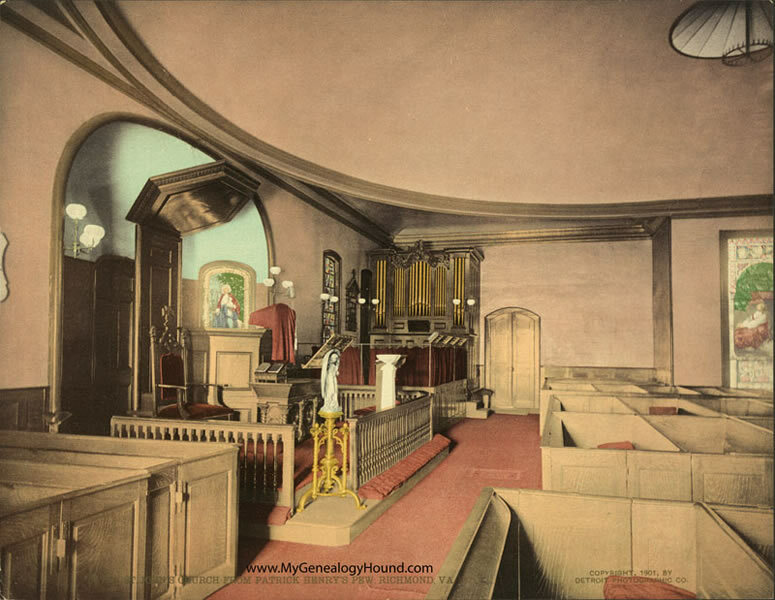 It is important to note that documentary evidence reveals that while other colonial Virginia churches were being built, decorative painters and gilders were employed to add finishing touches. It would not be unlikely that the sounding board at St. John’s received similar attention when it was new. In fact, the results of the paint analysis of the St. John’s sounding board show a complete history of paint and coating layering and revealed evidence of past paint and gilding. The samples reveal a history of glazes being used on the sounding board. These glazes are associated with white, off-white, or pale yellow paint, some of them possible evidence of wood graining. The fact that the surrounding frame of the sounding board shows these light colors suggest that the entire sounding board and cornice (except for the sunburst), were painted with light colors for much of its history. In addition, original off-white paint on the chamfered edge of the pine panel provides convincing evidence that the entire yellow pine surface was originally painted. Adding to this theory, Howlett is aware of no precedence for an eighteenth century panel having a painted chamfer and an unpainted flat surface. A sample as it appears under a microscope. 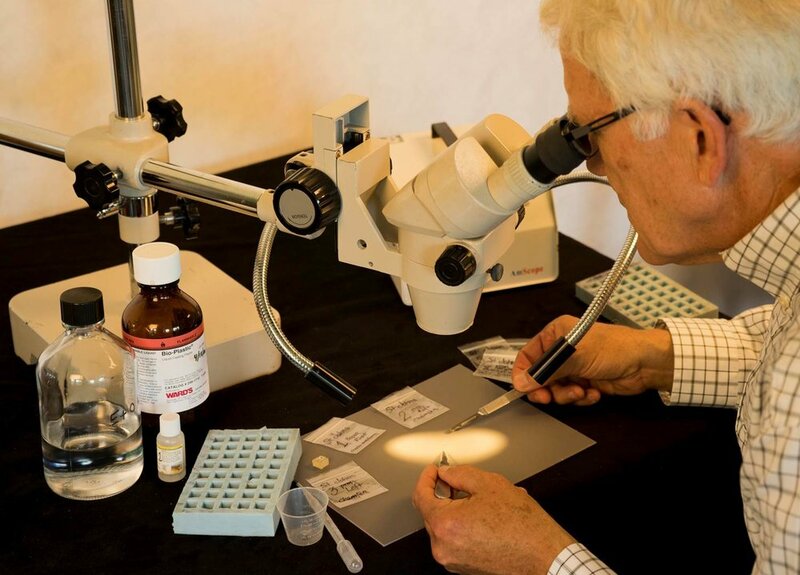 One sample contains a highly reflective fragment near the surface in the visible light photo that does not fluoresce in ultraviolet light. This fragment seems to be associated with a small amount of an oil-bearing varnish or size. It is conceivable that the tulip poplar rays were originally gilt to provide a gleaming contrast to the walnut rays and a light-colored background. If so, this tiny fragment may be a remnant of original oil gilding. Finally, photomicrographs of the samples give credence to the concern that the heavy layers of aging varnish are hindering a full appreciation of the design of the sunburst on the sounding board. The varnish is as much as three to five layers thick in places, with one particularly heavily applied layer. The dark amber of the yellowed, deteriorating coating is clearly visible in the photographs, as are visible films of dirt between the layers. It is obvious that the discolored coating constitutes a sepia-toned filter that renders the sunburst and its background nearly monochromatic. Howlett’s study and paint analysis have produced findings that will provide guidance to future conservation treatment and visual interpretation of St. John’s sounding board.